Thursday, July 7th was the begininning of Tanabata, our first taste of Japanese Matsuri! Considering it was a very rainy day, Orihime and Hikoboshi won’t have met this year 🙁 but that didn’t put a dampner on anyones spirits! Plenty of people were out braving the weather and having a good time. The street was lined with stalls selling food & drink plus plenty of games for kid, fantastic colourful Kusudama hung down from the lamposts, each adorned with streamers representing the strings that Orihime uses to weave. 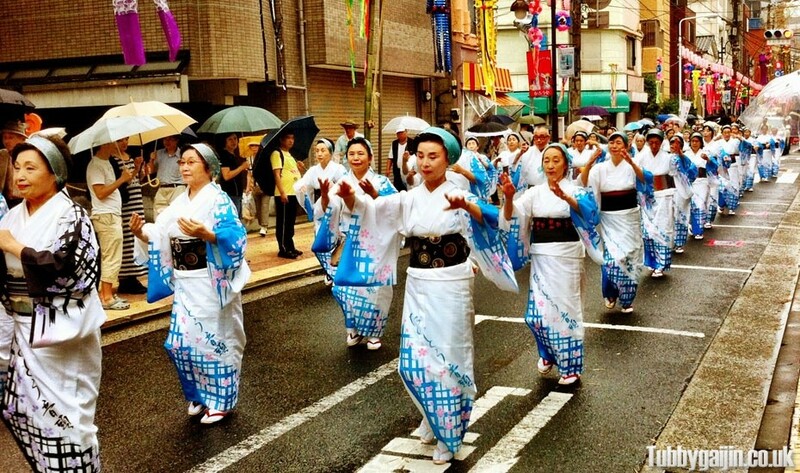 Later in the afternoon, a large dance procession made it’s was down the street, and smaller dance and music performances happened throughout the day outside a shrine on Kappabashi-Dori. At one point the rain was coming down quite hard, but the performers all carried on regardless. 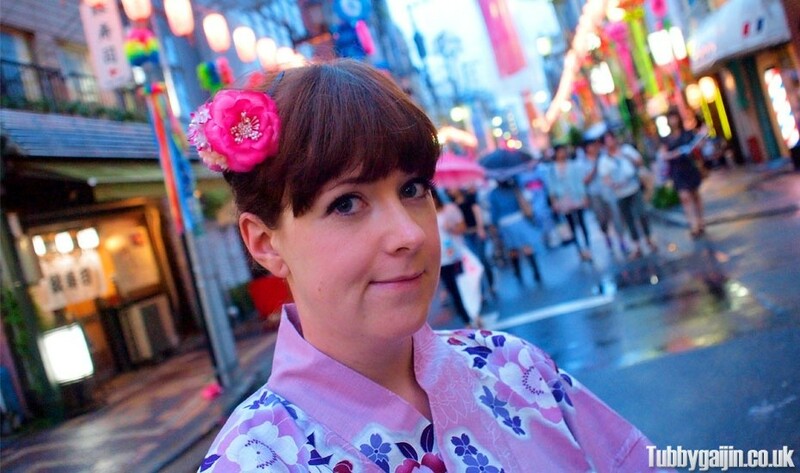 Emma got into the spirit by wearing her Yukata! There’s quite alot of tradition to each part of the Yukata, and it took a little while to get it all right, most important is to always fold the left side over the right – right over left is reserved for funerals! 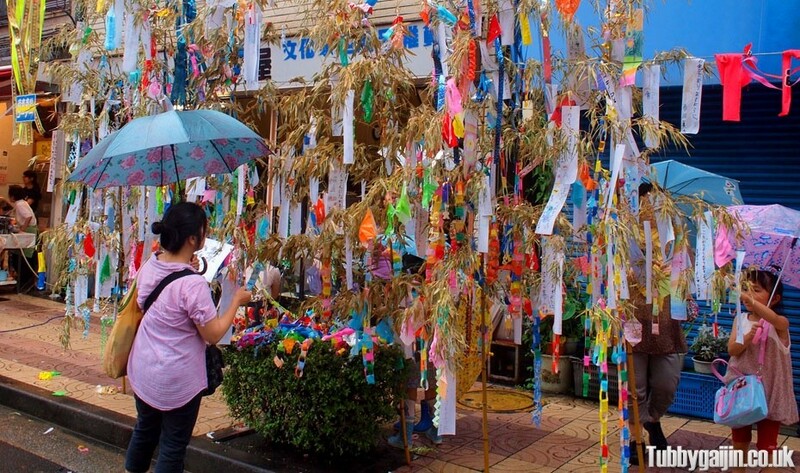 People celebrate Tanabata by writing wishes on small pieces of paper know as tanzaku, and hang them on bamboo as pictured above, decorations are often added too. After the festival, the bamboo and wish papers are sometimes set afloat on a river or burned, the tradition varies around the country. 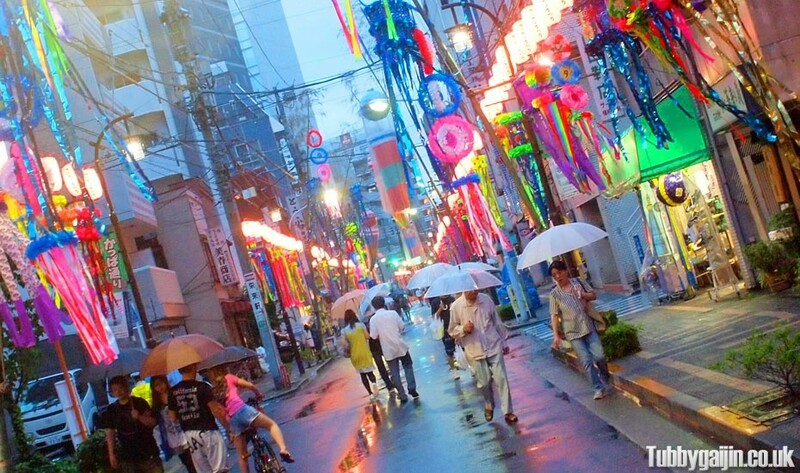 Despite the weather, Tanabata was great fun. I love how festivals carry so much meaning over here, and everything is steeped in such rich tradition.